The Charles and Catherine B. Rice Foundation, located in Atlanta, GA was founded in 2004 by Charles B. Rice and his wife Catherine. It is dedicated to revitalizing communities, preserving historical landmarks, safeguarding natural resources, promoting cultural and spiritual heritage and, serving as a catalyst for collaboration with others for positive and sustainable change. Recognizing the need to revive the economic base of the once prosperous communities in Early County, GA., the Foundation created Early County 2055 and provided funding for the initial planning process of a long-term revitalization initiative to protect the area's history and culture and renew the economy of Early County. Charles Rice grew up in Blakely, GA, the county seat of Early County, where his parents settled in the 1930s. The family legacy in Southwest Georgia is the basis for choosing Early County as the recipient of the EC2055 grant. Charles B. Rice, Sr. is the founder and director of the Charles and Catherine B. Rice Foundation. A South Georgia native, Mr. Rice grew up in Blakely where his parents Jean and Katha Rice settled in the 1930s. He and his wife Catherine established the Charles and Catherine B. Rice Foundation in 2004. 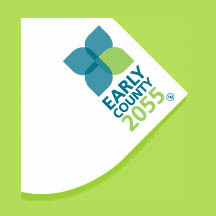 In 2006, because of the strong family history in Blakely and Early County, the Rice Family Foundation funded the Early County 2055 (EC2055) Revitalization Initiative as the first step in an effort to provide the area with an opportunity to prepare for the future, and grow and prosper through new economic opportunities. The founder of the Atlanta-based Barton Protective Services Inc. in 1977, Charles Rice developed the company into the second largest contract security service firm in the United States. The company provided customers with protection against fire, burglary, and a host of other services by providing security officers as well as emergency response, intellectual asset protection, concierge, and workplace-violence prevention services to clients in the United States and Europe. For five consecutive years, Barton Protective which employed some 13,000 peoplewas named by Fortune Magazine as one of the 100 Best Companies to Work For. Barton Protective merged with Allied Security in May 2004. Catherine is the co-founder of the Charles and Catherine B. Rice Foundation and an active member of the Early County 2055 Board of Directors. Catherine Boylen Rice worked side by side with her husband, Charles Barton Rice, Sr., to build, Barton Protective Services Inc., where Charles was chairman and founder. She was instrumental to the success of Barton Protective. An Atlanta, GA native and daughter of Anne Lee Bell Boylen and Herbert Lynn Boylen, Sr., she graduated from Marsh Draughon Business College and attended Georgia State College. Catherine was employed by Munich Reinsurance Company in Atlanta for 18 years, prior to joining her husband Charles at Barton Protective. Her philanthropic interests include The Georgia Trust, Friends of the River, Alexis deToqueville Society, Woodruff Arts Center, Child Kind and Battered Womens Shelter. She is the mother of Kimberly Anne and Charles Barton Rice, Jr., and the grandmother of eight beautiful children. C. Barton Rice, Jr. is the executive director of the Charles and Catherine B. Rice Foundation, which has funded the initial stages of the Early County 2055 project. Serving as liaison to the Early County community, Barton shares a grand vision with his parents to preserve the cultural richness of Blakely and Early County while at the same time creating a more viable economic model for the future. The grandson of longtime Blakely residents, Jean and Katha Rice, Barton spent many childhood summers in Blakely and holds a deep personal connection to the community. 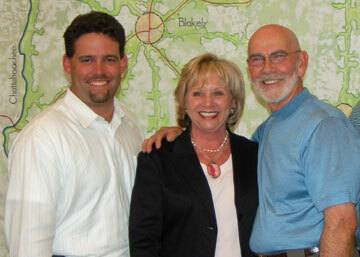 Barton received the 2007 Georgia Trend Magazine 40 Under 40 award, which honors the state's top individuals under the age of 40 who are poised to lead commercial, cultural, academic and governmental institutions into the future. In addition to EC 2055, Barton is also an active member of Vistage (formerly known as TEC) and consults and collaborates with small business owners all over the U.S.
Barton worked at the family business Barton Protective Services Inc. (BPS) from 1985 until its sale in August of 2004. While at BPS, Barton held management positions in Human Resources, Operations and Sales among many other roles. In 2002, he became the Chief Strategy Officer at the company's corporate offices in Atlanta. He received an MBA from the Goizueta Business School at Emory University in 1999 and graduated from The University of Georgia in 1992 with a BA in Geography. He and his wife Andrea Lauer, live in Roswell, GA, with their two sons, Nicholas and John Patrick.